The cultural implications for translation may take several forms, ranging from lexical content and syntax to ideologies and ways of life in a given culture. An accurate literary translation involves being able to match the authors original intent; it is considered an art on its own right. Without reliable book translation services, we would not have access to the classics of literature. Ideally, Bala A. Funtua is endowed with the ability to thoroughly understand all that a text says and implies; and excellent writing skills. Soon or late, the day is coming. Shall be trod by beasts alone…” Page 9. With this early success, the animals agree to the seven commandments that explain how every animal is equal and how each animal should treat its fellow animal. At first, the rebellion is an amazing success; the farm animals are excited and quickly change how everything is done in the farm. The animals do their tasks with far more efficiency than possible before and work more collectively, the harvest is the best they have ever seen, and everyone has more food and more leisure. They come up with various ideas from special committees (kungiyoyi) to windmill (Famfo) that will mean no work for animals. But slowly the pigs take more and more control, the principles begin to change conveniently; amending the commandments, the pigs continue to hide their excesses and as time goes by, the lower animals find themselves in the same position they were under the humans. Akawal (Boxer) and Aura (Benjamin) are the heart of the story; the author paints them as close friends, a friendship of entirely opposite personalities but with deep mutual respect. Akawal is the true believer, early on he takes as his motto ‘I will work harder’ and puts his heart and soul into making the farm a success. He also adds ‘Comrade Napoleon is always right’, setting aside his doubts and redoubling his efforts. What entices the more in this book is the way Bala A. Funtuwa vividly gives every character a linguistically correct and culturally relevant and befitting identity without affecting the original meaning. Some of these are: Karambana (Squealer), Godi (Clover), Hoge (Minimus), Kyalla (Muriel), Sangartatta (Mollie), Barde (Pinkeye), Burtu (Moses), Dafale (Bluebell), Durwa (Jessie), ‘Yarbaka (Pitcher), Mallam Nasaru (Whymper), Dano (Frederick) and Hakurau (Pilkington). Reading Gandun Dabbobi, one would think that all the incidents take place in Northern Nigeria by the way Bala intricately weaves the points together in the Hausa language. The major themes in Gandun Dabbobi includes: the power of idealism, the struggle for power, deceit, dictatorship, abuse of power, and impossibility of peaceful association amongst others. Lies, corruption and selfishness take over in the farm, leading to the end when Maitumbi and the rest of the pigs invite Mallam Nasaru (Whimper), Dano (Frederick), Hakurau (Pilkington) and other local farmers to visit the farm. 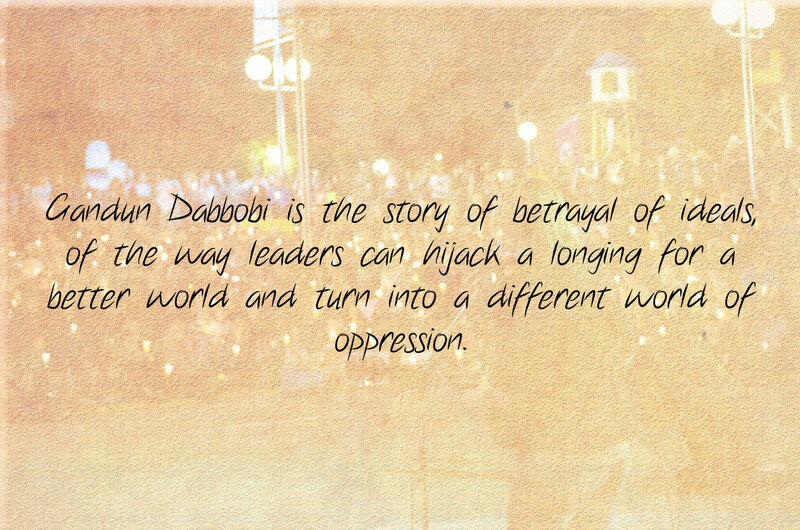 Gandun Dabbobi is a fascinating book to read. Jalaludeen Ibrahim Maradun, who hails from Maradun in Zamfara State, studied English at the Uthman dan Fodio University, Sokoto . He is an active member of the Zamfara State chapter of the Association of Nigerian Authors and author of the book “Beyond the Setting Sun” . He is a bilingual writer [English and Hausa] and his writings have appeared in newspapers and on the internet.